To mourn the passing of a loved one with a sense of occasion and a memorable send-off. There is something in the sound of the bagpipes that evokes our deepest emotions when we hear it. Being part of a funeral or a remembrance ceremony is a solemn privilege. I am able to bring an extensive repertoire to the occasion and play a special melody or support the occasion as the client sees fit. In times of sadness, I think it’s important that you are guided by your own compass and there’s no ‘rules’ on how the pipes can be used to help the occasion. With special selections of music, I’ve played ahead of coffins, piped mourners and hearses to the graveside, piped at gravesides and played at a distance during an ashes scattering. Whilst funerals are often a sad affair, a final farewell played on the bagpipes can help to start the healing process and encourage relatives to reflect on the life of the individual. 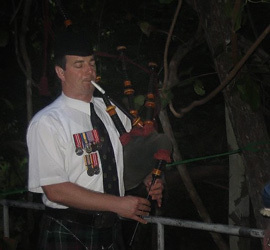 ANZAC Day Dawn Service at Hellfire Pass, Thailand. By their nature, funerals are organised at short notice, however I am readily available throughout the week.